The government said Thursday it will construct the country's first-ever national museum to promote Korean literature in northwestern Seoul. The Ministry of Culture, Sports and Tourism announced that the land where a state-invested housing complex for journalists was once located in Seoul's Eunpyeong district was finally chosen to be the location of the National Museum of Korean Literature. The government plans to spend 60 billion won ($53.6 million) to complete the museum by 2022. The museum will systemically collect, preserve and study the legacy of literature and original documents and be used as a multipurpose cultural space to exhibit, educate and provide first-hand experience of literature, it added. The Gijachon site was selected over three other finalists -- Culture Station Seoul 284, an art space in what was once Seoul Station, and Paju Book City and Heyri Art Valley, both located in Paju, northwest of Seoul. They were shortlisted among 26 sites submitted by various municipalities around the country. The designation came after nearly three years of heated debate over where to construct the national facility memorializing Korean literature. Initiated under a law legislated in Feburary 2016 to promote Korean literature, the project to build the museum began in May that year. But the culture ministry under the former Park Geun-hye administration halted the process of selecting the museum's location the following month due to overheated competition among municipalities to host the iconic museum. After many discussions and public hearings, the ministry under the current Moon Jae-in government designated Yongsan in central Seoul as the site of the museum in September last year. 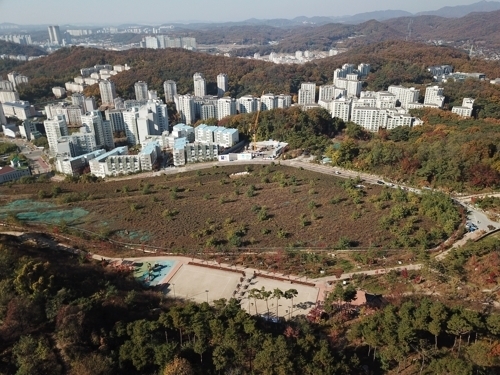 But it had to soon scrap the decision in the face of strong opposition from the Seoul municipal government, which wants to create a large ecological park at a nearby site in Yongsan when US troops stationed there complete their relocation to south of Seoul. The Gijachon site received high marks in various categories, including accessibility, scalability and possibility for international exchanges, Yom Moo-ung, chairman of the ministry-led government-civilian committee for the project, told reporters. "In particular, it was positively rated to be a good place for many literary figures and people to approach and for the chance of bringing a synergy effect with various literary and culture-arts facilities in the vicinity," he added. Eunpyeong Hanok Village, Savina Museum, a private art gallery and the national Institute for Translation of Korean Classics are in Eunpyeong. With the location for the museum finally decided, the ministry and the committee are now focusing on how to fill up the interior space. The ministry said it has received some 33,000 books and 100 relics of Korean contemporary literary writers in donation from the family of a late local collector. Among the donated items were rare copies of the first edition of novels by famous Korean writers, such as Chae Man-sik, Park Tae-won, Gu Bo and Han Seol-ya.